Celebrating some of our brilliant producers this year, our first spotlight is on Bill Bleasdale and Chava Richman; the duo behind the fantastic Welsh Mountain Cider. Find them all weekend at the Producers’ Market at Chadwick’s Place. Sum up Welsh Mountain Cider in a sentence. Live, naturally fermented, bottle-aged vintage cider, with no sulphites or anything else added to it. Our ciders are really quite different because we age them in the bottle for several years before selling them. Once bottled, we don’t add any stabilisers or sulphites. Instead, we leave the naturally occurring yeast to do its job, and let the ciders speak for themselves. They develop and blossom into a real range and depth of flavour. At the moment, we’re selling cider that was bottled in 2013 and 2014, although we still have a few from as far back as 2011. Sounds delicious! How do they taste? They range from crisp and light to darker, more full-bodied and tannic. It depends on the types of fruit we use, whether they’ve been aged in oak barrels, the length of time they stay in the bottle…among plenty of other reasons! So what about the apples themselves? We love to experiment and try out different varieties. We often source our apples and pears from small or abandoned orchards. One of them grows amazing Hereford Redstreak, which are incredibly tannic, sweet and juicy, and makes a delicious cider, especially when aged for a long time. We also have a tree nursery here on our smallholding with more than 450 types of apple, as well as dessert, culinary and perry pears. Last year, we were able to make all of our cider from our own fruit, and the aim is eventually to be able to grow the fruit, make the cider, age it and sell it all from here. It sounds like you have big ambitions. Can people come and learn from you? Our aim is never to make cider on a large scale, but to keep it all here on these few acres. We’ve done everything first-hand, learning as we go and, of course, we love to pass on our knowledge. 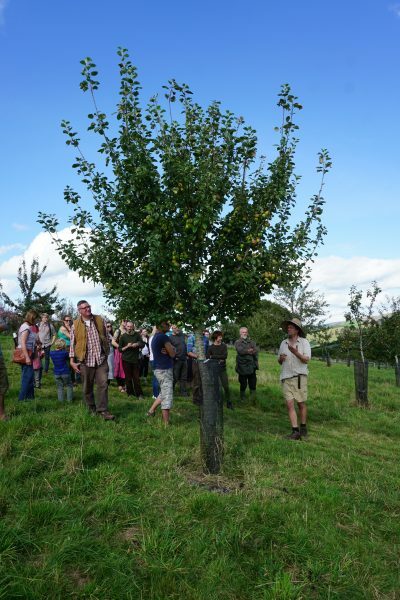 We grow trees and sell them, we make cider and we want to teach others how they can do the same. It’s amazing to have a chance to experiment with hundreds of different tree varieties and see what grows well and what doesn’t. It’s been an experiment since the start! We’re at over 1000 feet above sea level here, and when Bill planted the first trees around 12 years ago, all the books said it’d be impossible above 800 feet. It looks like we’ve proved them wrong. It’s all been a big a learning curve. When can we come and visit? We have tastings every Saturday between 2pm and 5pm and also by appointment for private or group tastings. We hold our Welsh Fermentation Festival every summer, where you can learn more about our cider, as well as other exciting stuff going on in the world of fermenting. There’s also lots of information on our website.